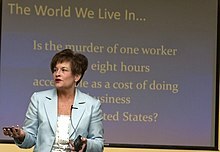 Deborah R. Collins, a survivor of workplace violence in the 1988 shooting at Electromagnetic System Labs, discusses the consequences of workplace violence. Workplace violence (WPV) or occupational violence refers to violence, usually in the form of physical abuse or threat, that creates a risk to the health and safety of an employee or multiple employees. The National Institute for Occupational Safety and Health defines worker on worker, personal relationship, customer/client, and criminal intent all as categories of violence in the workplace. These four categories are further broken down into three levels: Level one displays early warning signs of violence, Level two is slightly more violent, and level three is significantly violent. Many workplaces have initiated programs and protocols to protect their workers as the Occupational Health Act of 1970 states that employers must provide an environment in which employees are free of harm or harmful conditions. According to data from the US Bureau of Labor Statistics, in 2011 violence and other injuries caused by persons or animals contributed to 17% of all US occupational fatalities, with homicides contributing to 10% of the total. From 1992 to 2010, there were 13,827 reported workplace homicide victims, averaging over 700 victims per year, in the United States. Examination of the 2011 data shows that while a majority of workplace fatalities occurred to males, workplace violence disproportionately affects females. Homicides contributed to 21% of all occupational fatalities for women, compared to 9% for men. Of these homicides, relatives or domestic partners contributed to 39% of female homicide cases; male homicide cases were most likely to be perpetrated by robbers, contributing to 36% of male homicide cases. Most cases of workplace violence are non-fatal. From 1993 to 1999, an average of about 1.7 million people reported occupational violence. About 75% of these cases are considered simple assault, while 19% of cases are considered aggravated assault. There are four categories used to classify workplace violence: worker on worker, personal relationship, customer/client, and criminal intent. Worker on worker violence occurs when two people of the same occupation are violent towards one another, either physically, verbally or emotionally. A common example of this is when one worker has some sort of authority over another, such as a supervisor position over a supervisee. Personal relationship violence at the workplace occurs when an employee's personal relationship is brought into the workplace and causes disruption for the employee, his/her co-workers, and possibly the customers of that business. Victims of personal relationship violence are typically women. Customer/client violence occurs when there is violence between a customer or client of a workplace and an employee. The violence could be performed by the customer onto the employee or vice versa. Finally, criminal intent violence in the workplace occurs when there is no relationship between the person committing the violent act and the workplace or it's employees. The four categories listed above are further classified into three levels, depending on the situation. Level one includes signs such as the person bullying others, being rude or abusive, and uncooperative. At this level, one should carefully take note of the behaviors and report them to a supervisor. The supervisor may want to meet with the potential perpetrator to discuss his/her behaviors. Level two includes the potentially violent subject stating that he feels victimized and verbalizing threats, verbalizing wanting to hurt others, frequently arguing with others, seeking revenge, and refusing to follow workplace policies. In response to this behavior one should document observed behaviors, directly contact a supervisor, ensure that one's own safety is put first, and, if needed, contact first responders. The third level of workplace violence are currently violent situations such as threatening to harm one's self or others by either physical means or using weapons, demonstration of extreme anger, or destruction of property. In case of level three violence, one should ensure the safety of themselves followed by the safety of others, stay calm, cooperate with law enforcement, and leave the situation if possible. In the case of personal relationship violence, it is often hard to recognize levels one and two of violence because they typically occur outside of the workplace. Most personal relationship violence situations occur at level three, in which case the level three approach for handling the situation should be in place. The National Safety Council also recognizes excessive use of drugs or alcohol as well as absenteeism, or change in job performance that is unexplained. Paying attention to these warning signs and reporting them may help prevent events of workplace violence. Work Environment- As the work environment directly and heavily influences the employees and clients, it is crucial that the environment remains positive and open. This encourages better communication and positive attitudes in the workplace. Security- Additional safety measures such as security may help deter possible violent events from occurring. This could include security guards, cameras, or other technological machines such as metal detectors. Education- educating employees on current policies and procures as well as on possible warning signs of workplace violence. Performance / conduct indicators- ways to be aware of changes in employee behavior, such as absenteeism or change in performance. It is also recommended that employers treat terminated employees with respect in order to avoid the feeling that they are being victimized. Additional precautions may be alerting security that there will be job termination that day. According to the Department of Homeland Security in the situation of workplace violence, while staying calm, one should run, hide, or fight. It is suggested to only fight if there is are no other safe options. In the event of having to handle a violent or potentially violent person, there are five steps to follow. First demonstrate concern for the employee and show that you care. Second, do not judge the person, but observe their behaviors. Third is to demonstrate empathy. Fourth is to engage in conversation with them, let them express what will help them. Finally, work with them to create a solution that will not put anyone at risk. Patrick Henry Sherrill, a 44-year-old mail carrier from Edmond, Oklahoma, was reprimanded after a heated argument with two supervisors on August 19, 1986. At approximately 7:00 the following morning, Sherrill showed up at the post office in his uniform. Over the course of the next 15 minutes, Sherrill went on a murderous rampage, gunning down any employee who crossed his path. After sealing off the exits, Sherrill ended up murdering fourteen coworkers and wounding six others. When police arrived at the post office, Sherrill turned the gun on himself. At 6:45 a.m. on August 26, 2015, 41-year-old Vester Lee Flanagan, a disgruntled ex-reporter for Roanoke station WDBJ-TV, shot and killed two former colleagues live on television in Moneta, Virginia. At the time, 24-year-old WDBJ reporter Alison Parker was conducting an interview of local chamber of commerce executive Vicki Gardener as 27-year-old videographer Adam Ward filmed the interview on a live feed. Flanagan, who had been previously terminated from his position at WDBJ, captured the three via a body cam and appeared to wait until the piece was airing before he began shooting and emptied his Glock handgun of all bullets. Gardener who was also shot survived the attack. After the shootings, Flanagan fled the scene and later boasted about the attack on social media before he was killed by police. On December 2, 2015, county health inspector Syed Farook and his wife, Tashfeen Malik, burst into a banquet room in San Bernardino, California where approximately 80 of Farook's co-workers were gathered to attend a holiday party as well as a company training session. Farook and Malik, who were dressed in military-style attire and armed with rifles, killed 14 people and injured 22 others. The couple also attempted to bomb the facility. Later, they were killed in a shoot-out with police. On February 26, 2016, 38-year old Cedric Ford who was employed as a painter at Excel Industries in Hesston, Kansas shot and killed three people and injured 14 other people. A co-worker reported that approximately two hours after the two men had clocked in for their shift at work that day, he saw Ford strapped up with his weapon and shooting at people in the factory's parking lot. On March 20, 2016, a 55-year-old retired state trooper with the Pennsylvania Turnpike system named Clarence Briggs of Newville, Pennsylvania returned to the roads he used to patrol prior to his retirement and attempted an armed robbery at a toll booth. Briggs shot and killed toll booth worker Danny Crouse, 55, and Ron Heist, 72, a security guard before he was shot and killed by the authorities. On April 8, 2016, workplace violence erupted at Lackland Airforce Base in San Antonio, Texas. At that time, the squadron's commanding officer was shot and killed by an airman who then killed himself. Thereafter, the facility went into lockdown mode. Soon after the shootings, it was reported that the incident was not a case involving terrorism but was workplace violence. The shooter was being escorted to a disciplinary hearing when he committed the murder-suicide. On May 4, 2016, a man who had been involuntarily terminated two weeks earlier from his position at Knight Transportation in Katy, Texas approximately 20 miles west of Houston returned to his former workplace armed with a shotgun and a pistol. Marion Guy Williams, 65, was reported to have said words to the effect of "You all ruined my life." Williams then shot and killed a 34-year-old supervisor Michael Dawid, injured two other employees and then killed himself. On June 8, 2017 a grocery story employee named Randy Stair age 24 blocked all entrance/exits to the Weis Market in Tunkhannock, Pennsylvania where he was employed and opened fire. Stair killed three co-workers before turning his gun on himself and committing suicide. Dating back to July 2016, Stair left behind a cache of disturbing and violent images, cartoons, videos, and messages on-line for the world to view on his social media accounts. Amongst other things, Stair posted numerous images of himself with his shotguns. He went so far as to name them "the twins" and is even seen caressing and kissing one. In one of his videos Stair proclaims “All souls are fair game.” Stair who idolized the Columbine killers Eric Harris and Dylan Klebold. On April 3, 2018, Nasim Najafi Aghdam opened fire on her co-workers at Youtube headquarters in San Bruno, California, killing herself and sending 3 others to the hospital. Police describe it as workplace violence. In a study performed by Baron and Neuman, researchers found pay cuts and pay freezes, use of part-time employees, change in management, increased diversity, computer monitoring of employee performance, reengineering, and budget cuts were all significantly linked to increased workplace aggression. The study also showed a substantial amount of evidence linking unpleasant physical conditions (high temperature, poor lighting) and high negative affect, which facilitates workplace aggression. Individuals who resort to mass shootings at work often threaten to kill before any actual violence takes place. The risks to the health and safety of persons not in his employment arising out of or in connection with the conduct of him or his undertaking". The Canadian Centre for Occupational Health and Safety lists the following higher risk occupations. Health care workers are at high risk for experiencing violence in the workplace. Examples of violence include threats, physical assaults, and muggings. According to estimates of the Bureau of Labor Statistics (BLS), the rate of nonfatal occupational injuries and illnesses involving days away from work was 15.1 per 10,000 full-time workers in 2012. This rate is much higher than the rate for total private industries, which is 4.0 per 10,000 full-time workers. Monitoring workplace violence trends is essential to identifying targeted prevention strategies. The Occupational Health Safety Network (OHSN) is a secure electronic surveillance system developed by the National Institute for Occupational Safety and Health (NIOSH) to address health and safety risks among health care personnel. Hospitals and other healthcare facilities can upload the occupational injury data they already collect to the secure database for analysis and benchmarking with other de-identified facilities. NIOSH works with OHSN participants in identifying and implementing timely and targeted interventions. OHSN modules currently focus on three high risk and preventable events that can lead to injuries or musculoskeletal disorders among healthcare personnel: musculoskeletal injuries from patient handling activities; slips, trips, and falls; and workplace violence. OHSN enrollment is open to all healthcare facilities. ^ "Occupational Violence". WorkSafe. Retrieved January 8, 2013. ^ "HRC - DOL Workplace Violence Program - Office of the Assistant Secretary for Administration and Management (OASAM) - United States Department of Labor". www.dol.gov. Retrieved 2019-03-08. ^ Flynn, Gillian (July 2000). "Employers can't look away from workplace violence". Legal Insight. Retrieved March 8, 2019. ^ a b c "Census of Fatal Occupational Injuries, 2011" (PDF). US Department of Labor, Bureau of Labor Statistics. Retrieved January 8, 2013. ^ a b c "CDC - Occupational Violence - NIOSH Workplace Safety and Health Topic". Centers for Disease Control and Prevention, National Institute for Occupational Safety and Health. Retrieved January 8, 2013. ^ "NIOSH-WPVHC-Workplace Violence Types". wwwn.cdc.gov. Retrieved 2019-03-09. ^ "Workplace Violence". www.nsc.org. Retrieved 2019-03-09. ^ a b c "HRC - DOL Workplace Violence Program - Office of the Assistant Secretary for Administration and Management (OASAM) - United States Department of Labor". www.dol.gov. Retrieved 2019-03-08. ^ Barling, Julian (1996). "The Prediction, Experience, and Consequences of Workplace Violence" (PDF). Retrieved March 8, 2019. ^ a b "Workplace Violence". www.nsc.org. Retrieved 2019-03-04. ^ Sheely, Gary (May 2018). "Know When to Act to Prevent Workplace Violence". Professional Safety. 63: 42, 43. ^ Lamar Jr, Jacob V. (June 24, 2001). ""Crazy Pat's" Revenge". Time. ^ Magnuson, Ed (June 24, 2001). "David Burke's Deadly Revenge". Time. ^ a b "Three keys to reducing workplace violence risks". Retrieved 2016-05-09. ^ a b c "The Growing Epidemic of Deadly Workplace Violence and Three Ways to Prevent It -- Occupational Health & Safety". ohsonline.com. Retrieved 2016-05-09. ^ CNN, Steve Almasy, Kyung Lah and Alberto Moya. "14 killed in San Bernardino shooting; suspect ID'd". CNN. Retrieved 2016-05-09. ^ "Retired state trooper kills two in Pennsylvania toll plaza shooting". Reuters. 2016-03-21. Retrieved 2016-05-09. ^ Buss, AH (1961). The Psychology of Aggression. ^ Baron, RA; Neuman, HA. "Workplace violence and workplace aggression: Evidence on their relative frequency and potential causes". Aggressive Behavior. 22: 161–173. doi:10.1002/(SICI)1098-2337(1996)22:3<161::AID-AB1>3.0.CO;2-Q. ^ Lee, Seungmug; McCrie, Robert (2012). "Mass Homicides by Employees in the American Workplace" (PDF). ^ Bureau of Labor Statistics. Nonfatal Occupational Injuries and Illnesses Requiring Days Away from Work, 2012. Retrieved March 13, 2014.